British motorists could be allowed to turn left at red traffic lights if new US style road proposals are introduced to the UK. Traffic consultants from LeaseCar.uk, believe rush hour congestion in the UK’s largest towns and cities could be massively eased if we adopt American style road conventions. In most US States it is legal to turn right on a red light if safe to do so. Given that we drive on the opposite side of the road it would mean making a left turn at red lights would become acceptable in Britain. Campaigners from LeaseCar.uk, say the move would reduce fuel emissions, decrease journey times and ease congestion at junctions. Having less vehicles sat waiting at red lights would help the environment and drivers’ pockets, by improving fuel efficiency and reducing pollution in the locality. 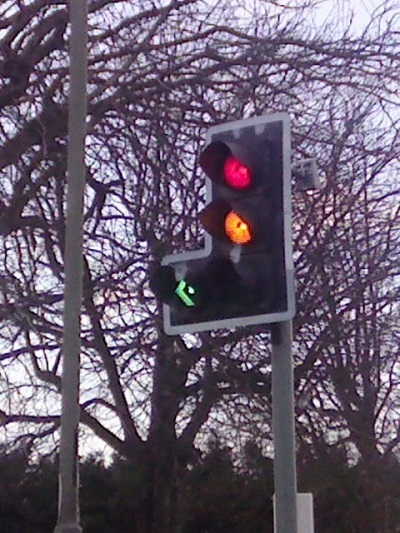 Allowing Brits to turn left on red lights would also cut traffic jams in some of the busiest cities, especially at rush hour and upon exiting motorways or major A-roads. As motorists would also get to their destination quicker, the new law could also help stimulate the economy and encourage physical activity, with Brits wasting less time sat in their cars. In the USA, where they drive on the opposite side of the road, most states (with the exception of places like New York City) always allow drivers to turn inside, around a corner to the right, under a red stop light. Campaigners from LeaseCar.uk said turning inside on red is also a commonly permitted in many other countries across the world to smooth the flow of traffic. It is legal in Canada, China, Costa Rica, the Caribbean, Lebanon, Mexico, Saudi Arabia, Thailand – even parts of Australia and some EU countries (at junctions where signs permitting the practice have been installed). In the USA turning inside on red is only allowed after the driver has brought the vehicle to a full stop and then checked their manoeuvre will not be dangerous. Adopting the practice in Britain would feel similar to driving through junctions where specific left-turn slip lanes already skip busy traffic lights or roundabouts and then join the new carriageway further down, via a give-way sign. Gareth Roberts, who is spear-heading the campaign from LeaseCar.uk said: “We want people to get from A to B in less time and using less fuel. “So we are calling on the government to be proactive with motoring regulations and follow the lead of our friends across the pond. “Clogged up British roads are a frustrating and polluting nightmare and no driver, or passenger, enjoys sitting at traffic lights unnecessarily. “But allowing motorists to turn left on red lights – by that I mean hugging the inner corner – would reduce fuel emissions, decrease journey times and ease congestion. “The number of cars on the road in the UK keeps growing, but parliament could help manage some of the problems by introducing a common sense bill to permit turning inside on red. “As with the American version of this law, the left-turning driver would still have to stop and assess there is no risk before attempting the manoeuvre.